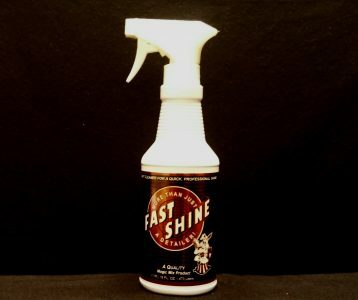 Fast Shine is a multipurpose cleaner/detailer that delivers a quick, professional shine to a variety of surfaces. Fast Shine won't streak or leave a residue, contains no perfumes or dyes, and is perfect for today's clear-coat painted cars. Fast Shine can be sprayed directly onto any hot surface, even in direct sunlight —making it especially effective on tough fingerprints, water spots, bird droppings, bugs, dust and light dirt. FASTSHINE won’t streak or leave a residue, contains no perfumes or dyes, and is perfect for today’s clear-coat painted cars. Fast Shine works great on painted surfaces, fiberglass, plexiglass, stainless steel, chrome, plastic, rubber, vinyl and glass. Its versatility makes it ideal for racecars, show cars, trucks, motorcycles or any vehicle in need of a radiant shine. Just spray on and wipe off with a soft, lint-free cloth. The average user can do an entire car in just a few minutes. FASTSHINE is body shop safe. Fast Shine will be added to Cart!